Vega thinks that’s because of great teaching, but also the underlying vision of this school: help students become the best version of themselves. 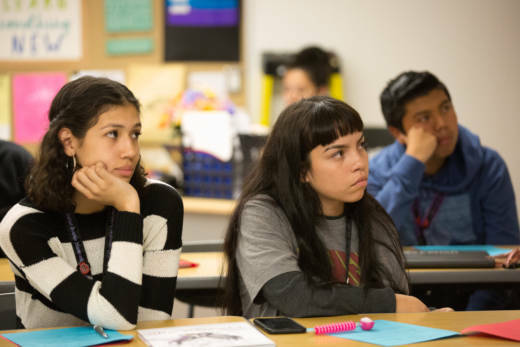 With that vision guiding every decision -- from how to support students on academic probation, to hiring -- Social Justice Humanitas has built a school where teachers’ voices are central, and everyone is looking out for one another. "A lot of times in education, as teachers, we’ve been taught to wait for someone above us to tell us what to do," said Jeff Austin, a founding teacher. “And make your plans according to the district or the state, and we were just like, we want to make plans according to our students." "What has made us successful, and I think a lot of people are starting to listen, is the huggy-touchy stuff,” said Jose Luis Navarro IV, the founding principal of the school. “The stuff that freaks people out. Adults making themselves vulnerable. Building real relationships." Listen on Apple Podcasts, Google Play, NPR One or wherever you get your podcasts to hear what love sounds like in the hallways and classrooms of Social Justice Humanitas Academy, a school that’s getting results with kids who are often on the losing side of the achievement gap.